Add the ability to run a new pipeline on-demand. Adding it to the build results page would make it easier to promote to another environment. I'm guessing this is as a workaround until a continuous delivery pipeline with a manual deployment step is possible? changed title to Add the ability to run a new pipeline on-demand. Issue #14740 was marked as a duplicate of this issue. Issue #14406 was marked as a duplicate of this issue. Good news - you can now manually run any pipeline that is defined in your YML file through the UI from either the Branches or the Commits view. 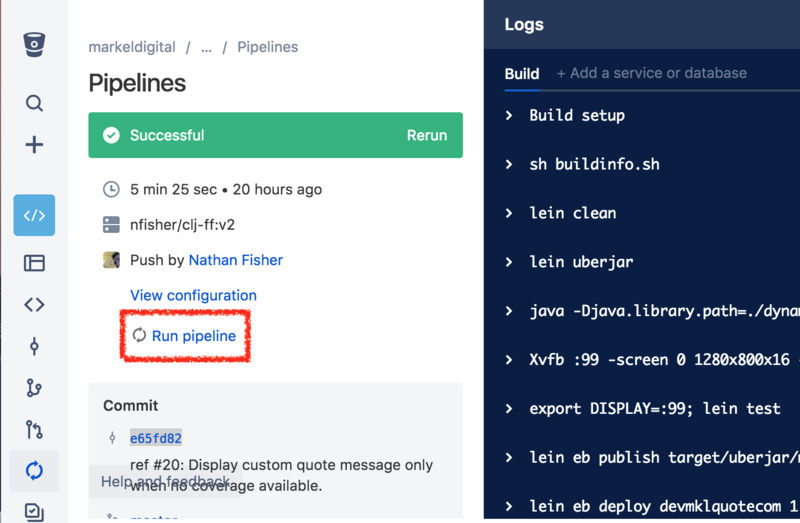 Running a pipeline from the Commits view lets you target a specific commit to build. Running a pipeline from the Branches view will build the head of the branch. While this doesn't solve the original problem outlined in the description, it does make it simpler to manually run pipelines on the head of the branch. Providing the ability to run a pipeline from within the results of another pipeline is unlikely to be something that we will allow - the result page is very specific to the context of the original pipeline that was run. The option to run a new pipeline for a different commit does not belong on the context of this page.